I setup this blog for a number of reasons. 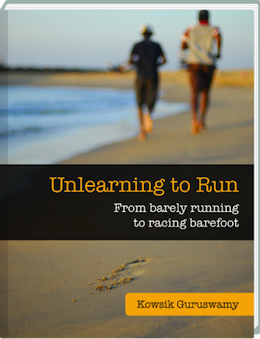 As I began running (barefoot), I wanted to share my experience, connect with other runners and learn and write about the secrets of distance running (especially as a late bloomer). This blog is not primarily financial driven. However, FTC requires bloggers to provide disclosures whenever there could be hidden interests or unspoken biases relating to recommendations. I need you, the reader, to know that many of the links on this blog are affiliate links and I make small commissions on the sales of these products. So occasionally you might see an Amazon link that makes me 4 cents instead of an Amazon link that makes me 0 cents, assuming you go through with the purchase of the recommended product. I’m a runner devising my own ways of fixing myself and learning and writing about what I’m constantly discovering about myself. I’m neither a certified trainer, lawyer, dietitian nor a physician. So use your own judgement when you try out any of the exercises or recipe in this blog. YMMV.